Since having the twins 6-weeks ago, I have had major writers block. It’s disappointing because I love sitting down and just writing. It’s like waking up and running to the coffee pot full speed to find it empty, just a few little drips around the edges of the pot. So. Sad. I’m pretty sure the lack of inspiration is due to the all nighters, leading to a constant state of sleepiness. Sleepiness that has disabled my brain of the ability to create any one sensical thought. With what brain cells I have left and with the minimum activities I have going on in my life right now. Taking care of three kids and sneaking in daily workouts, I started to compare babies to a spin class. Random. Yes. Why, you ask? I have no idea. But let me share with you my findings. And maybe I can get you on board with this weird comparison. If in the end it still makes no sense to you, then blame the baby brain, ok? Spinning is damn hard. So why do we torture ourselves? We torture ourselves because we know it’s awesome and it creates results. When I find myself comforted by my heinous, baggy, running tank that covers all of my un-coveted new post partum baby curves I know it’s time to register for class. The moment I sit on the bike and the warm up begins I begin strategizing how I can slink out of this torture chamber with no notice. By the time I come up with the perfect plan the class is over. I feel awesome and its time to register for the next class. But you and your hubby sit around enjoying bottomless glasses of wine, conspiring the new great idea to have more babies. Why? Because you forgot what it’s like to have a baby. So many of us go back for more. Or you simply haven’t had one yet. Obviously, in the oblivion of childcare, this is the best idea in the world. Then you look at the pregnancy stick and all signs point to ‘knocked up’ and your stomach drops. 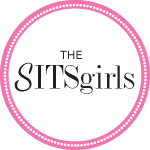 What did we just sign up for…? The sprint begins. Legs are pedaling like you are racing the Daytona 500. The beat of the music is fast and loud and you’re almost dancing in your seat. It’s tough but by the time you want to scream mercy and ferociously attack the energizer bunny spin instructor, the song has ended. You fall into a rhythm of feedings, diaper changes, tummy time, laundry, cleaning, cooking (ok, cooking is a stretch) and everything else in between. You are constantly testing yourself on just how much you can accomplish when, dare I say, all the children are sleeping. Racing mindlessly to the tune of your own beat, trying to stay ahead. 7am turns 7pm and there is no recollection of what just occurred or was even accomplished in those last 12 hours. The climb begins. The beat slows, you settle back into your seat, head down, eyes closed, legs grinding. You dig deep to find the strength inside to make it to the top of the damn hill. Your heart opens and at any moment you feel a tear could surge from your eyes. You got this. It’s mental strength at this point. You hear the all to familiar cry. Already? You slowly open your lids and look at the clock. 3am. Didn’t we just do this a short, very short, three hours ago? With every ounce of strength in your body, you pull yourself up and out of bed, pick up the baby that suddenly feels like she weight 50lbs and start the process all over again. You sort of want to cry out of pure tiredness, but there is no time for that. So you nurse, change diapers and attempt to rock the babie(s) back to sleep… I would probably throw another diaper change in there because, well, you know once you are ready to put them down they will inevitably go. Body in motion, brain is sleeping. At the time you find yourself wanting to dismount the bike and fling your chap stick at the spin instructor, the most precious words you will ever hear in your life are said… “We are done.” Oh, sweet lord. Victory. You feel amazing. Cloud 9. You can conquer anything that is headed your way. You pyscho-ishly run to register for the next class, in fear it will fill up without you. Babie(s) are finally asleep. You sit at the edge of your bed with the dim light of the moon glowing in your window and you stare in admiration. Gazing at their absolute beauty, their perfect little faces, the little droop of their lips and their angelic closed eyes. Sleeping so peacefully. Your heart wants to explode out of your chest. Could you love any harder? So 2 years later (or whatever it may be for you) you psycho-ishly sign up for more. Babies that is. There you have it. 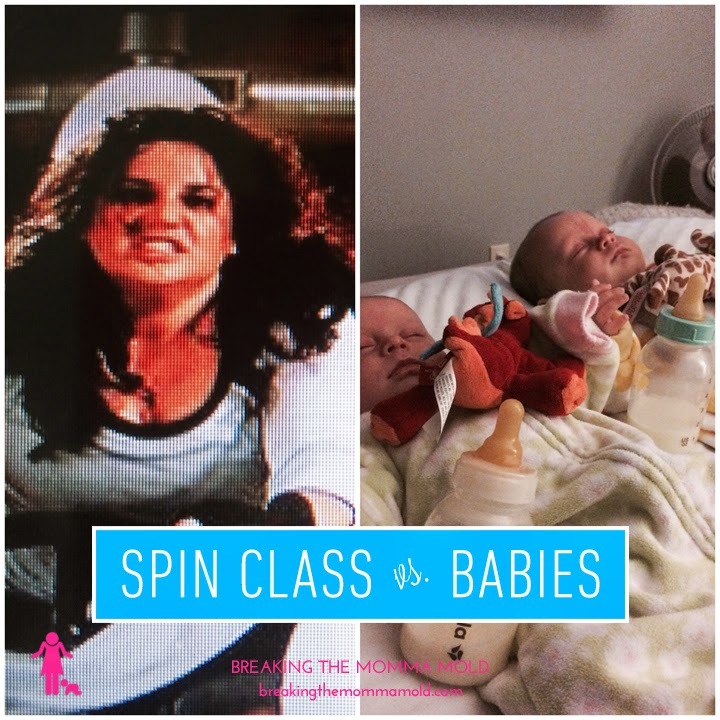 Spin class vs. babies. Where heaven and hell collide. Like I said, don’t ask. It’s the only thing that has flowed from these fingertips in weeks and you are taking the brunt of it. I know some of you brain dead moms out their have imagined up weirder so if you are brave enough, share your baby brain theories! The weirder, the better. Love it! I remember those days, or those nights!!! Haha, thank you Just A Touch Of Crazy! Well for someone who’s had writer’s block, this was pretty darn awesome. Fabulous comparison… I found myself nodding along. Visiting from the Blog Staycation. It was a pleasure to meet you. Thank you, Jennifer and thanks for visiting! The Blog Staycation was AWESOME. I truly enjoyed it! Jessica: this is so your style! Apparently you’ve busted right through that writer’s block. Congrats! Looking forward to the next super comparison post! Great comparison! I remember those times so well and don’t think I could’ve blogged so well back then, so kudos to you! Lol perfect Jess! Spin class is a strange type of torture… Right up there with cluster feeding…. Probably the only time I was on the verge of “returning” my son lol! Thank goodness he has finally grown in to his chunky little self and can sleep through the night like a CHAMP!